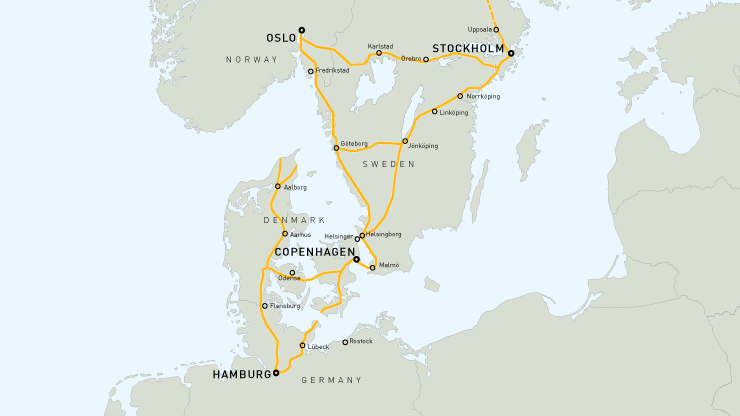 The GREAT project will make TEN-T Scandinavian-Mediterranean Corridor between Hamburg and Oslo/Stockholm one of the first to meet the EU’s directive for alternative fuels. The project will contribute to the decarbonisation of the transport sector, and therefore has the potential to make the corridor an EU best-practice example on how to meet environmental and climate challenges. The unique combination of regional public authorities and private companies working together creates opportunities for new and dynamic developments. The GREAT project is initiated by the political network STRING as a way to meet the urgent need to lower harmful emission levels from European road transportation, both light and heavy. The project takes a holistic approach to promote all kinds of alternative fuels for road transport. It targets end users in a unique collaboration between the public sector, private providers of alternative fuels and vehicle manufacturers. The project will highlight the business models of alternative fuels infrastructure to speed up the decarbonisation of road transport. The overall goal is to reduce fossil emissions by establishing a strongly increased market demand for alternative fuels transport solutions by ensuring access to supply over the long distances between metropolises in northern Europe. The successful introduction of cleaner transportation solutions on a large scale remains critical to the current European Union goals for reducing reliance on fossil fuels and their effect on the environment. The GREAT project is co-financed by the European Union’s Connecting Europe Facility, who contributes 50% of the overall budget. The project has a total budget of approx. 14 million Euro. Great hosts a unique combination of private companies and regional authorities. The lead partner in the project is Region Skåne that in turn is supported through Partnership Agreements by the Supporting Partners.